My brother's smart bride registered for Mikasa Parchment by the set instead of by the $50 place setting. Right now Dillards is clearancing the entire 42-piece set for $69. Mikasa is no longer in business, so tell her to get everything she wants in this pattern now, and include some extra pieces. that is beautiful and classic pattern too, what a deal! I had to look up our Mikasa china--it has doubled in price since we got married 4 1/2 years ago. YIKES. Today, our Dillards has an extra 30 percent off of clearance items too. My step-daughter registered for the place settings in that same pattern a few years ago. I looked it up on line, and noticed that it cost a fraction of the price purchased by the set. She did get a lot of single place settings, and is still in boxes in her basement. I don't think young brides even use good china and silver any more, at least in this part of the country. Such a smart girl. We made the mistake of registering by the place setting (around $50 a setting). I think we got about 10 places settings as gifts and none of the completer parts. 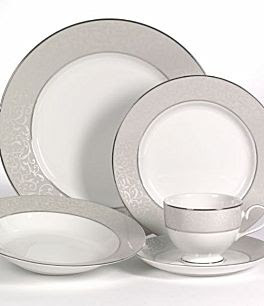 I felt like a complete idiot when I discovered, a year later, that I could have gotten an entire set of similar china for under $200 with all the pieces included. I'm seriously tempted to buy a complete set of something else for under $100 and just mix and match them. Thanks Meredith! I was able to get something much nicer than we have right now for company! What a deal! I didn't register for China when I got married 5 years ago and instead registered a higher quality (Noritake) everyday set. At the time, we were living in small quarters and I figured that eventually I'd buy a set of China for myself on clearance or second hand when we had more space. We now have the space so I was very intrigued by this deal. We don't have Dillard's where I live, but I could order the 45 piece set for just $8.95 shipping and no tax! I was tempted, but ultimately decided to hold off for now. I'd love a set of China, but am doing just fine with what I have. I hope I don't regret passing up this deal! I don't think you will regret it. China isn't something most people ever need. I think a great set of white plates is a wonderful compromise. You could serve the CEO of any company a good meal with care and warmth--and it would outstrip any fine china dinner. However, if your everyday plates are colorful or extremely casual, and you have the space/money, a boxed set like this Mikasa is a better-than-average deal. Also, Dillards has FAR better shipping prices than most department stores. I ordered 5 $20 crystal bowls (marked down from $75) for wedding gifts--and they only charged $8.95 to ship a giant heavy box with extreme bubblewrapping. I didn't get the china- but I bought some serving dishes on sale! Thanks! Thank you for this! I purchased the set at the last minute for my sister. I had been looking for a LONG time for a wedding gift for her. I checked again this morning and the price is up again to just under $100. Thank you! I had just ordered it from Macy's for twice the price, and I had been happy with that. You saved me $250. Thank you, so much.